The film is based on the autobiography of Wladyslaw Szpilman, who was playing Chopin on a Warsaw radio station when the first German bombs fell. Szpilman's family was prosperous and seemingly secure, and his immediate reaction was, "I'm not going anywhere." We watch as the Nazi noose tightens. His family takes heart from reports that England and France have declared war; surely the Nazis will soon be defeated and life will return to normal. It does not. The city's Jews are forced to give up their possessions and move to the Warsaw ghetto, and there is a somber shot of a brick wall being built to enclose it. A Jewish police force is formed to enforce Nazi regulations, and Szpilman is offered a place on it; he refuses, but a good friend, who joins, later saves his life by taking him off a train bound for the death camps. Then the movie tells the long and incredible story of how Szpilman survived the war by hiding in Warsaw, with help from the Polish resistance. Szpilman is played in the film by Adrien Brody, who is more gaunt and resourceless than in Ken Loach's "Bread And Roses" (2000), where he played a cocky Los Angeles union organizer. We sense that his Szpilman is a man who came early and seriously to music, knows he is good, and has a certain aloofness to life around him. More than once we hear him reassuring others that everything will turn out all right; this faith is based not on information or even optimism, but essentially on his belief that, for anyone who plays the piano as well as he does, it must. Polanski himself is a Holocaust survivor, saved at one point when his father pushed him through the barbed wire of a camp. He wandered Krakow and Warsaw, a frightened child, cared for by the kindness of strangers. His own survival (and that of his father) are in a sense as random as Szpilman's, which is perhaps why he was attracted to this story. Steven Spielberg tried to enlist him to direct "Schindler's List," but he refused, perhaps because Schindler's story involved a man who deliberately set out to frustrate the Holocaust, while from personal experience Polanski knew that fate and chance played an inexplicable role in most survivals. The film was shot in Poland (where he had not worked since his first feature film, "Knife in the Water," in 1962), and also in Prague and in a German studio. On giant sets he recreates a street overlooked by the apartment where Szpilman is hidden by sympathizers; from his high window the pianist can see the walls of the ghetto, and make inferences about the war, based on the comings and goings at the hospital across the street. Szpilman is safe enough here for a time, but hungry, lonely, sick and afraid, and then a bomb falls and he discovers with terror that the running water no longer works. By now it is near the end of the war and the city lies in ruins; he finds some rooms standing in the rubble, ironically containing a piano that he dare not play. The closing scenes of the movie involve Szpilman's confrontation with a German captain named Wilm Hosenfeld (Thomas Kretschmann), who finds his hiding place by accident. I will not describe what happens, but will observe that Polanski's direction of this scene, his use of pause and nuance, is masterful. 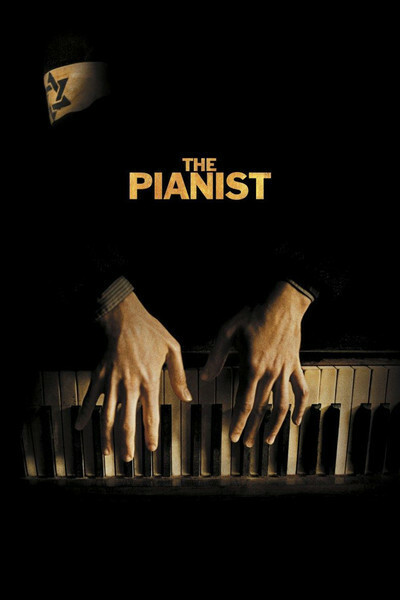 Some reviews of "The Pianist" have found it too detached, lacking urgency. Perhaps that impassive quality reflects what Polanski wants to say. Almost all of the Jews involved in the Holocaust were killed, so all of the survivor stories misrepresent the actual event by supplying an atypical ending. Often their buried message is that by courage and daring, these heroes saved themselves. Well, yes, some did, but most did not and--here is the crucial point--most could not. In this respect Tim Blake Nelson's "The Grey Zone" (2001) is tougher and more honest, by showing Jews trapped within a Nazi system that removed the possibility of moral choice. By showing Szpilman as a survivor but not a fighter or a hero--as a man who does all he can to save himself, but would have died without enormous good luck and the kindness of a few non-Jews--Polanski is reflecting, I believe, his own deepest feelings: that he survived, but need not have, and that his mother died and left a wound that had never healed. After the war, we learn, Szpilman remained in Warsaw and worked all of his life as a pianist. His autobiography was published soon after the war, but was suppressed by Communist authorities because it did not hew to the party line (some Jews were flawed and a German was kind). Republished in the 1990s, it caught Polanski's attention and resulted in this film, which refuses to turn Szpilman's survival into a triumph and records it primarily as the story of a witness who was there, saw, and remembers.